3D Tagz Studio. It so easy, Make it, Stick it, Wag it, Tag it! With this magical Tagz studio, decorate and personalise printed images! Pop on a strap and tag your books, bags, pencil case or anything special. 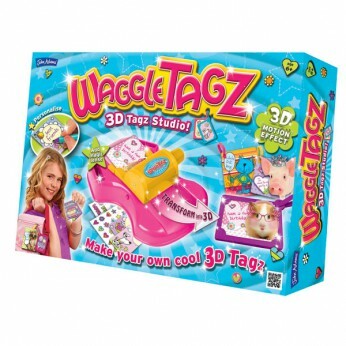 Waggle Tagz make great ID cards and invitations or can be used on special gifts. Contents include waggle tagz workstation, printed cards and lenses (2 sizes) holders for small cards, tagz, sticker sheet, and instructions…. This toy costs approximately £19.99 (for the latest and best prices make sure you check our retailer list for the Waggle Tagz above). In our review of Waggle Tagz we classed it as being suitable for ages 3 years, 4 years, 5 years but recommend you check the manufacturer specific advice before purchasing.